Defining and managing sales, franchise or dealership areas and territories is quite a tedious task without access to specialised GIS software. However, the cost of deploying such software within a business, or employing external consultants to help in creating hardcopy maps of territories, may be prohibitive for many. 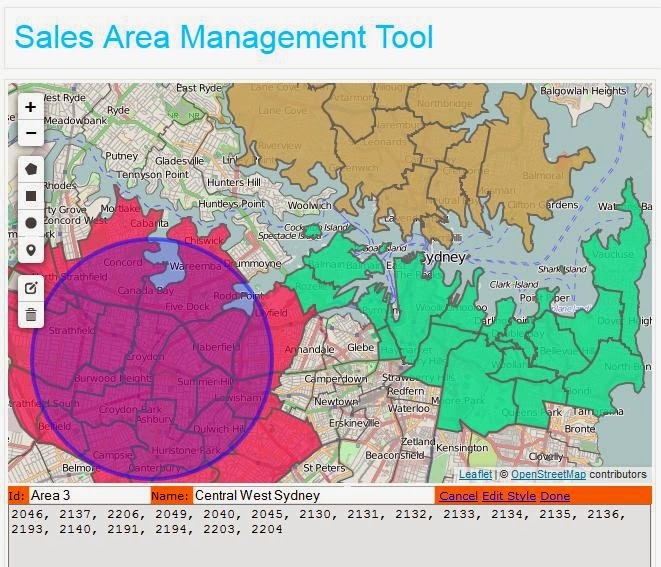 Sales Area Management Tool from aus-emaps.com is an online application that will make the process of creating and managing sales territories much, much easier and it costs only a fraction of the other options. Postcodes are the most popular spatial unit used for defining sales territories hence postal boundaries are included as a default option. They are small enough to allow quite precise definition of local neighbourhoods yet, there is a manageable quantity of them covering entire Australia. More administrative boundaries for Australia, as well as other countries, will be added progressively. The tool is very simple to use and does not require any specialised knowledge. Sale territories can be created by adding individual polygons to the list either by clicking on the desired polygons or by drawing shapes that approximate areas of interest on the map (drawing options include rectangle, circle or irregular polygon). Alternatively, a comma delimited list of postcodes can be pasted into a text area under the map or postcode numbers can be typed in one by one. Advanced conflict resolution process is implemented in this application to prevent creating areas with invalid postal codes or allocating a polygon to more than a single sales area. For ease of identification, sales territories are coloured in random colours. Colour settings, including transparency, can be adjusted as required. Each sales territory can be identified with a unique id and name. Individual sales areas can be edited or removed from the map if required. The result can be saved for reuse as a csv file or in JSON format, which preserves colour schema selected for individual sales areas. JSON version can be uploaded back to the application to continue with editing at a later time. A convenient by-product of “radius select” function is ability to identify polygons that intersect with a circle of predefined radius from a selected point. Version 1 of Sales Area Management Tools is available for customers as an advanced beta release. To arrange access, please email your request to info@aus-emaps.com with relevant contact details. There are attractive revenue sharing opportunities for affiliates co-marketing Sales Area Management Tool. Please, email your expression of interest to info@aus-emaps.com for additional details.